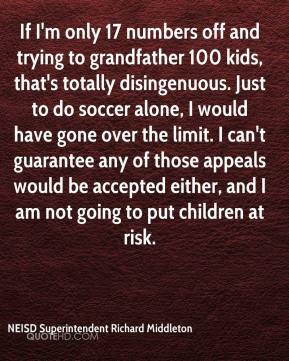 If I'm only 17 numbers off and trying to grandfather 100 kids, that's totally disingenuous. Just to do soccer alone, I would have gone over the limit. I can't guarantee any of those appeals would be accepted either, and I am not going to put children at risk. 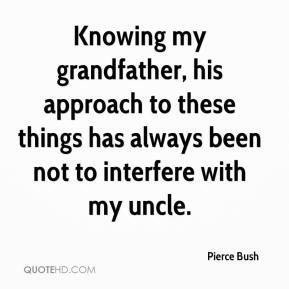 Knowing my grandfather, his approach to these things has always been not to interfere with my uncle. 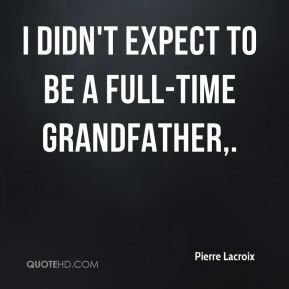 I didn't expect to be a full-time grandfather. 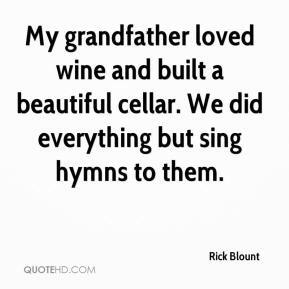 My grandfather loved wine and built a beautiful cellar. We did everything but sing hymns to them. Right after World War II my grandfather, Gus Anderson, started this company because he felt there was a need for this kind of manufacturing and that there were a lot of companies to play off of, especially in Bridgeport. 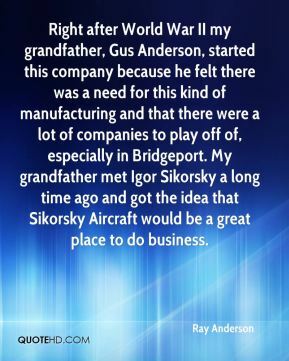 My grandfather met Igor Sikorsky a long time ago and got the idea that Sikorsky Aircraft would be a great place to do business. 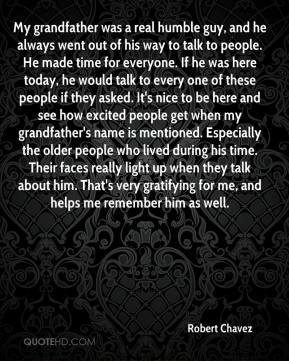 My grandfather was a real humble guy, and he always went out of his way to talk to people. 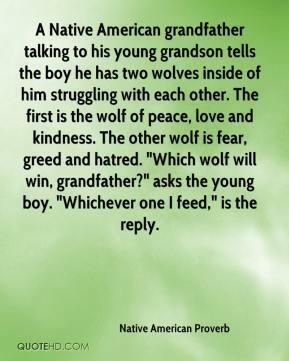 He made time for everyone. 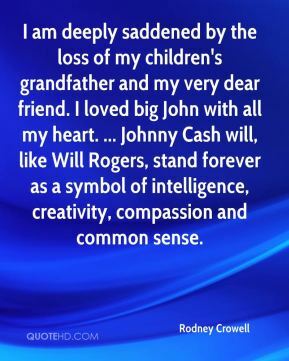 If he was here today, he would talk to every one of these people if they asked. 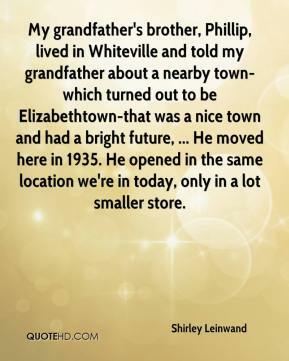 It's nice to be here and see how excited people get when my grandfather's name is mentioned. 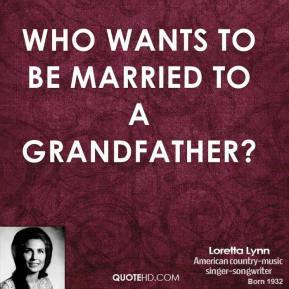 Especially the older people who lived during his time. Their faces really light up when they talk about him. 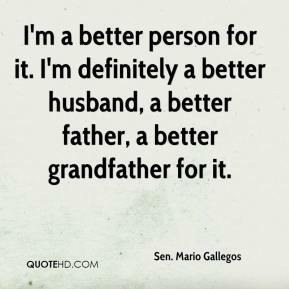 That's very gratifying for me, and helps me remember him as well. 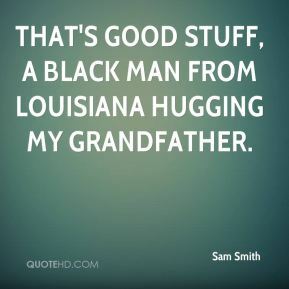 That's good stuff, a black man from Louisiana hugging my grandfather. Whenever I feel that Hollywood is getting to her, I have her spend time with her grandfather. 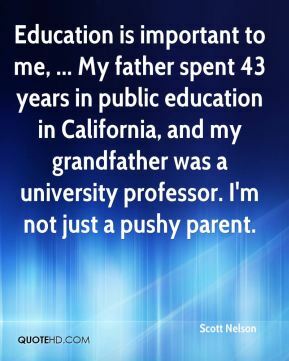 Education is important to me, ... My father spent 43 years in public education in California, and my grandfather was a university professor. 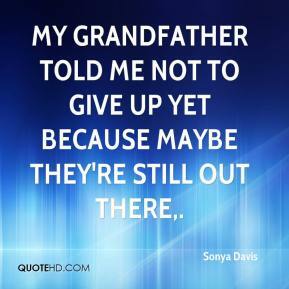 I'm not just a pushy parent. 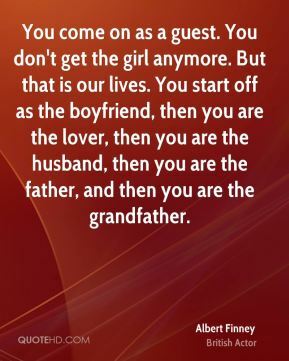 That is the traditional way. My grandfather who grew roses did it. 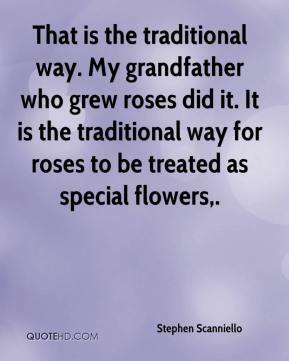 It is the traditional way for roses to be treated as special flowers. 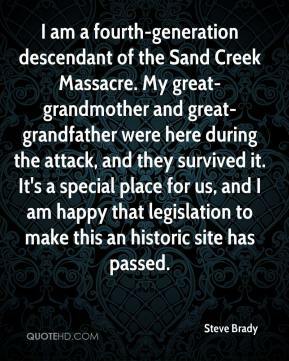 I am a fourth-generation descendant of the Sand Creek Massacre. My great-grandmother and great-grandfather were here during the attack, and they survived it. It's a special place for us, and I am happy that legislation to make this an historic site has passed. 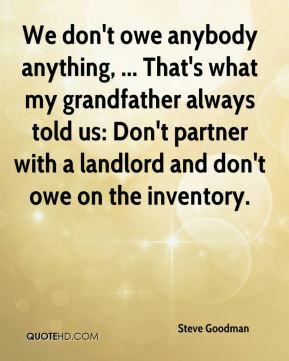 We don't owe anybody anything, ... That's what my grandfather always told us: Don't partner with a landlord and don't owe on the inventory. 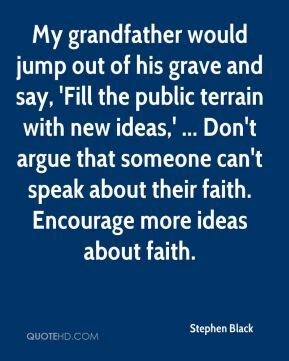 My grandfather would jump out of his grave and say, 'Fill the public terrain with new ideas,' ... Don't argue that someone can't speak about their faith. Encourage more ideas about faith. 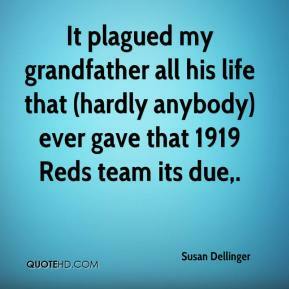 It plagued my grandfather all his life that (hardly anybody) ever gave that 1919 Reds team its due. 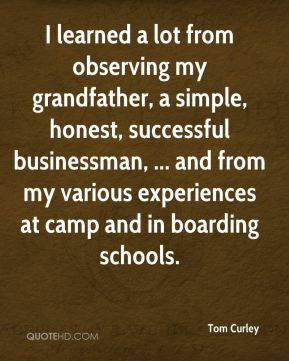 I learned a lot from observing my grandfather, a simple, honest, successful businessman, ... and from my various experiences at camp and in boarding schools. 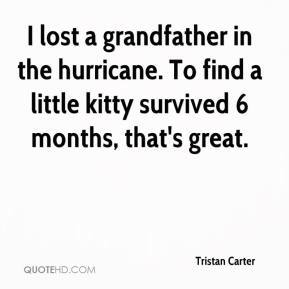 I lost a grandfather in the hurricane. To find a little kitty survived 6 months, that's great. 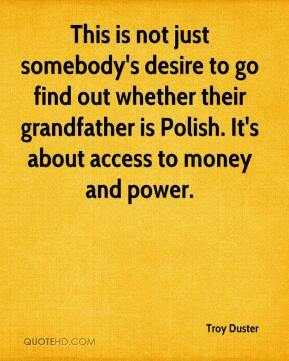 This is not just somebody's desire to go find out whether their grandfather is Polish. It's about access to money and power.